iRecruit’s customers have received an average of 131 new employment applications in the month of November. This is down slightly from October which showed an average 151. This number actually varies based on the number of jobs posted. No matter how many applications you receive each month, managing and responding to candidates can be a burden on just about any sized HR department. If you receive candidates and have to manage them in different sources such as a job board account, email, or even paper it becomes almost impossible to properly manage. It’s even more of a task to get consistent reporting of your recruitment activities. iRecruit can help you successfully manage that burden. As a single database, you can link to your website and job boards to advertise and recruit candidates. All candidates are directed to iRecruit to submit their information giving you one centralized source of candidates, with reporting at a click of a button. Communicate with candidates, schedule interviews, and manage all your tasks in one easy to use applicant tracking software. Are you hiring? 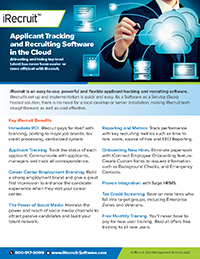 iRecruit is a cloud-based recruiting and applicant tracking and electronic onboarding software designed to provide any size of business a cost effective, affordable and truly simple way to manage the recruiting and onboarding process online. With options for Express, Professional and Enterprise, you can find a flexible recruiting and onboarding solution that works for your budget, and meets your needs. Join us for a demo or ask a question. This entry was posted in Blog, iRecruit Blog and tagged average number of employment applications. Bookmark the permalink.